My friend Joby called to say that she and Ted had eaten at a small restaurant that no guide she looked through had thus far noticed. What made the lack of ratings even stranger was its location. It’s about a block from the Place de la Concorde metro stop, one parallel street north of the rue de Rivoli. How closer to the epicenter of Paris tourism can you get? She hoped I would go with them when they ate there again. We arranged to meet there for dinner in mid-week. 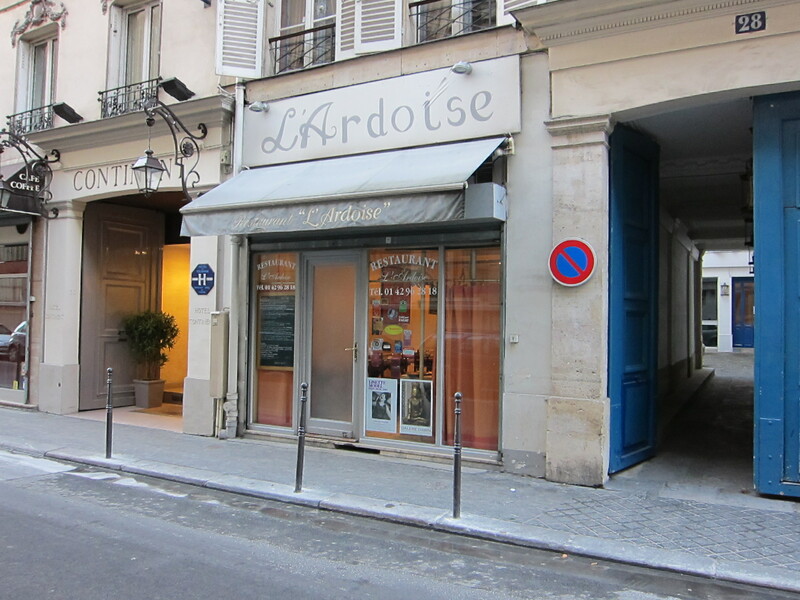 In semi-darkness, the outside of Ardoise was so innocuous and bland that I walked by it twice. The interior was no more encouraging. The colors of the walls and decoration fell somewhere on the color spectrum between beige and brown. The ambiance teetered on the edge between dowdy and kitsch. I noticed a staircase by the front door that led to an underground dining room. The narrow street level dining room could seat about 15 diners. The woman serving us stood a tall chalkboard up on the unused chair at our table. We were impressed by the number of dishes offered. Ted and Joby were further impressed that they saw few repeats from the menu the week before. They offered a set menu of 3 courses for 34 euros, which we all thought was a pretty good deal. Two of us ordered the same first course. On a round plate covered with a butter-yellow lemon sauce sat a rectangular pastry packet filled with a flavorful mince of escargots, poitrine fumée (bacon but better than bacon), and mushrooms. The homemade dough was a compromise between puff pastry and phyllo as it is made in home (not the commercial paper thin kind we associate with baklava). Alongside it was a small salad of bitter greens. The other first course on the table arrived in an inflated aluminum balloon. When pierced, it released a cloud of aroma foretelling the presence inside of a pile of mussels and langoustines in a buttery broth. For the main course, I had roast pidgeon, cut into four pieces, braised in a red wine reduction, and small potatoes. The pidgeon’s flesh was rosy, just as I like it. A little under seasoned but delicious. The most interesting — and replicable at home — combination of flavors on the table were seared scallops sharing space on a scallop shell with a large spoonful of buttery pureed celeriac. We agreed that dish represented best the inspired fantasy of the chef. Ted had a very tender piece of filet of beef with pommes Anna. Of the three desserts we ordered, two were the usual pots de crème in various flavors. The winner was Ted’s chestnut soufflé, a truly seasonal dessert. While we ate, we concentrated on and talked about the food. I looked up at one point and caught the woman who served us glancing at us surreptitiously with a smile on her face as she drew up a bill for another table. Her glance told me that this establishment has not yet become jaded. They still take pleasure in seeing people recognize and enjoy the quality of their food. The service, by the way, was excellent. At the end of the meal, the three of us were so happy with what we’d eaten that a fear siezed me. “What if this meal turns out to be better than Taillevent?” I squeaked. Joby had succeeded in getting us reservations for lunch at one of the world’s best restaurant at the end of the following week. “It’s a possibility we’ll just have to face,” said Joby.